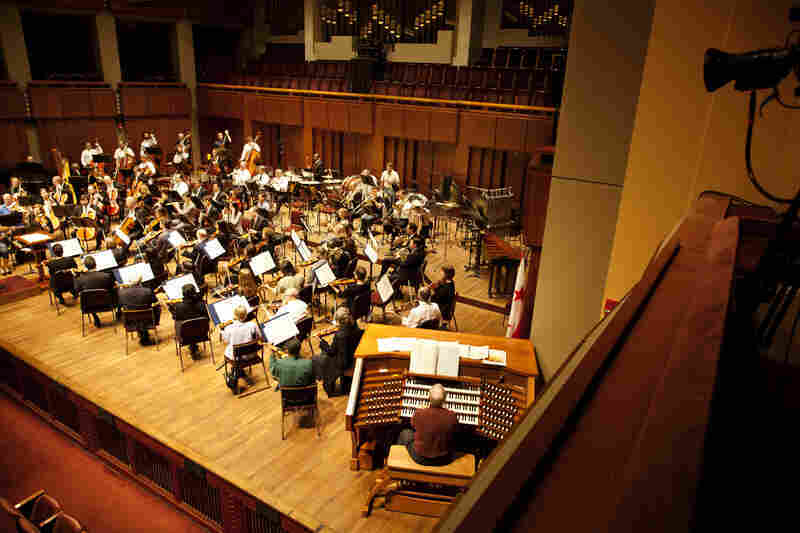 Kennedy Center's New Organ No Longer A Pipe Dream The old organ was in bad shape and beyond repair. Now, after more than two years of construction and installation, a new organ has arrived and will make its debut on Nov. 27. 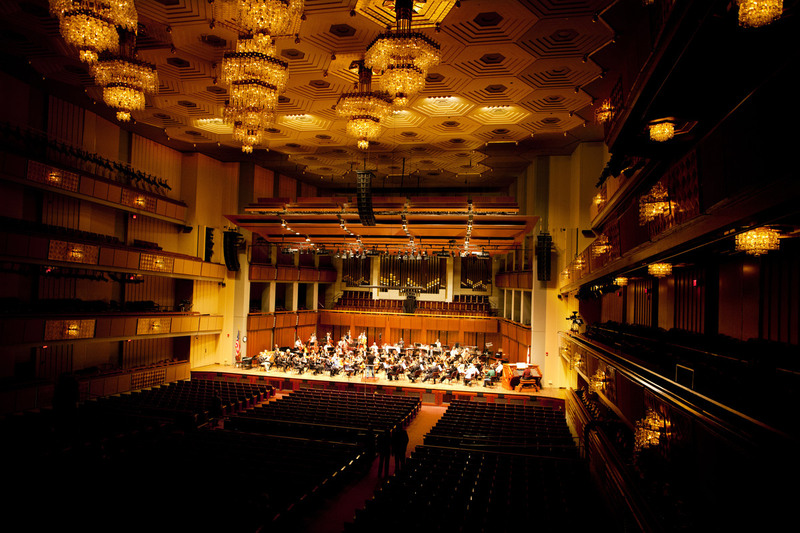 After years of waiting, the Kennedy Center has a new symphonic organ replacing its old organ installed in 1972. The $2 million project will culminate in the organ's debut on Nov. 27. 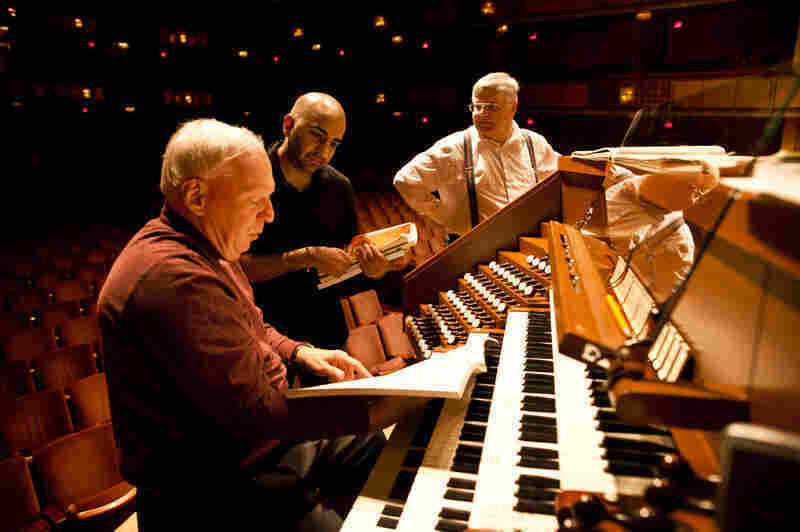 William Neil (left), the National Symphony Orchestra organist, speaks with NSO Assistant Conductor Ankush Kumar Bahl (center) during the organ's test with the orchestra on Oct. 18. Neil plays the organ while organ consultant Jeff Weiler pushes and pulls stops during the test. Building the organ took nearly two years, plus more than three months for installation. 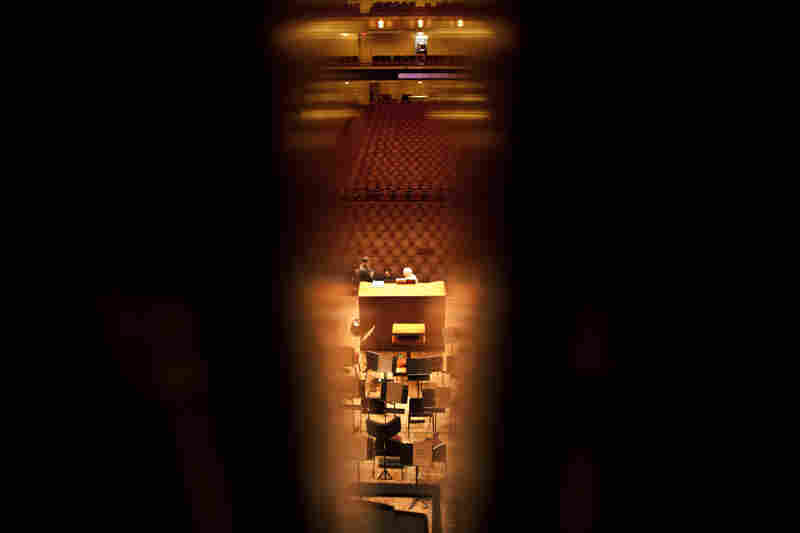 The organ console and concert hall as seen through the pipes of the organ chamber set behind the orchestra. 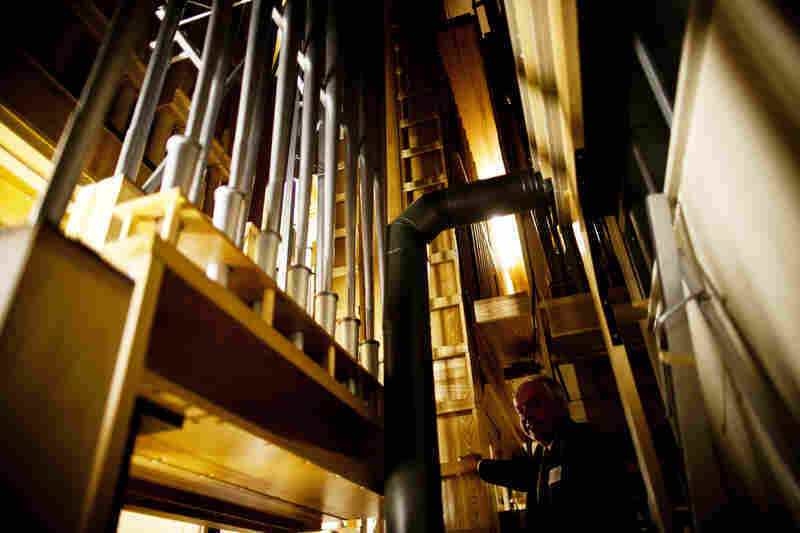 The new organ boasts 1,000 more pipes than the previous one — nearly 5,000 pipes in total. Jacquelin Rochette, artistic director of Casavant Bros., gives a tour of the labyrinthine organ chamber. The Montreal-based company was founded in 1879 and specializes in building, renovating and installing pipe organs. Pipes inside the organ chamber range from five-eighths of an inch to 32 feet long, with varying shapes and diameters. Each pipe is meticulously tuned to create the organ's unique tonality. Rochette stands along a narrow passageway deep inside the organ chamber. The cluster of pipes in the center are the only ones that remain from the old Filene Great Organ, installed in 1972. Weiler pulls on the "Filene" stop, named after Catherine Filene Shouse, the donor of the first Kennedy Center organ dismantled earlier this year. The wooden console has 103 stops, which are responsible for balancing the treble and bass — the lows and highs of each pipe. 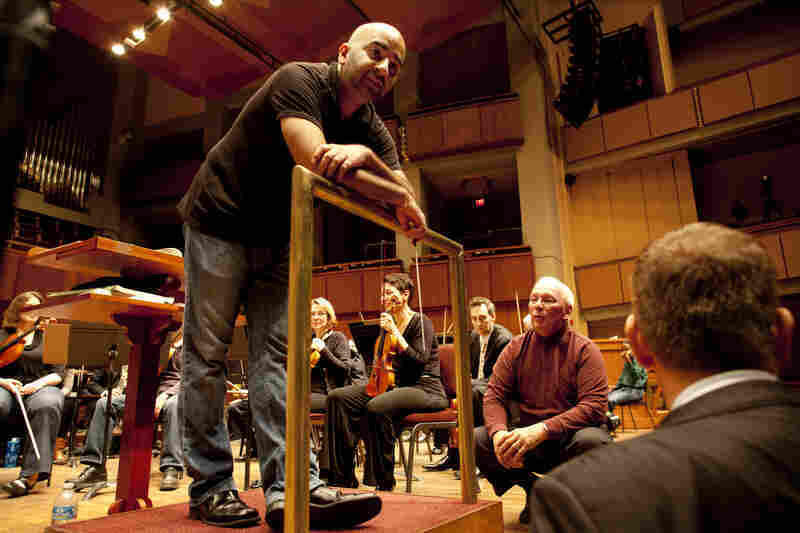 Bahl (left) speaks with Neil (center) and Weiler about the organ's test performance with the orchestra on Oct. 18. After six weeks of toning and tuning, the team just needed to make a few final refinements. "We had to tone it down today. We heard too much organ," said Weiler. "It's much easier to make an organ softer than louder, but the power is there." 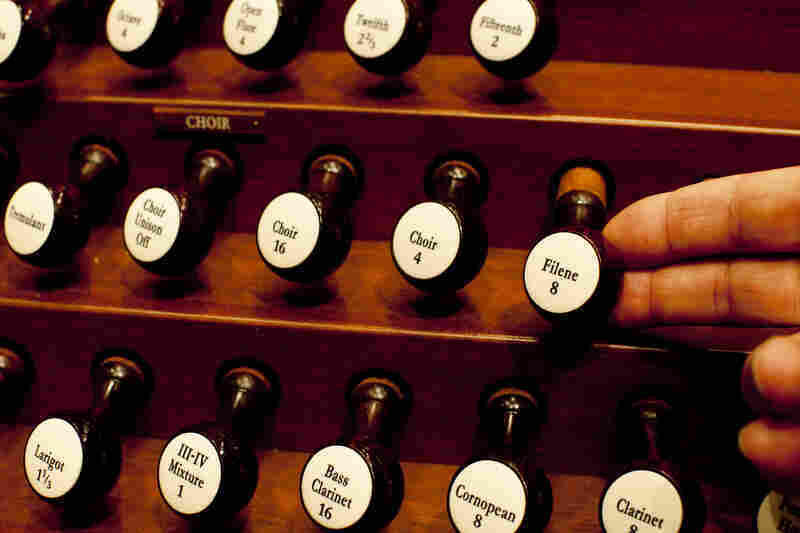 A concert hall organ has to have the right balance — powerful enough to be heard over the orchestra and chorus, but blending in like any another instrument. Towering over the stage, the organ looks big, but you have no idea how big. There are some 5,000 pipes, ranging from five-eighths of an inch to 32 feet long, and weighing a total of 20 tons. The old Kennedy Center organ, to put it bluntly, was sick — so sick that at one performance a few years ago, they had to stop the concert to unstick a recalcitrant key. Organ consultant Jeff Weiler was called in to examine the patient and concluded that the instrument was just not salvageable. Other consultants agreed. 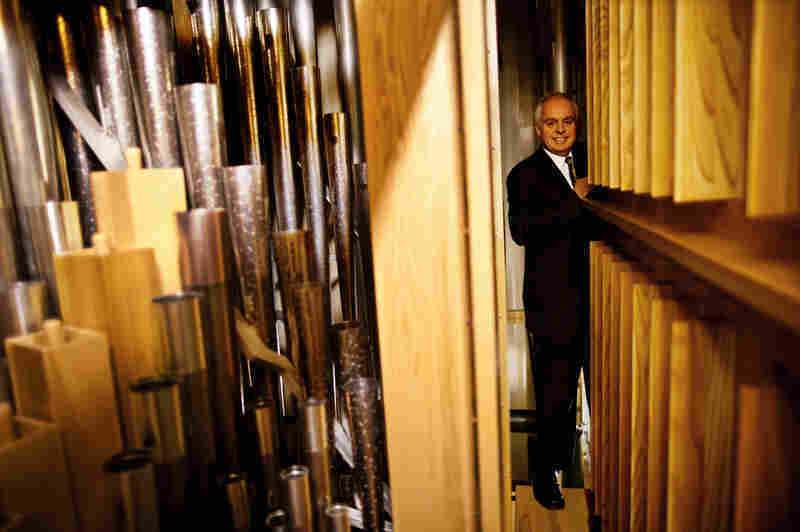 The old organ was the "dying gasp" of a once-great company, Weiler explains. Right after it was delivered in 1972, the company, Aeolian-Skinner, went out of business. And when the organ began to falter, inspection showed that it had been jerry-built, using parts and tailings from other projects. Two years ago, a donation from Kennedy Center Chairman David M. Rubenstein allowed the performing arts center to take the plunge and order a new organ, this time from Casavant Bros., near Montreal, a company that has been making organs since 1879. The new organ was tested with the orchestra on Oct. 18. Just building the organ took two years. Then came the installation, a process that from beginning to end has taken more than three months. The partially assembled instrument was delivered in August by a trio of 53-foot-long semitrailer trucks. After the organ was assembled in the hall, the delicate process known as "tonal finishing" began. 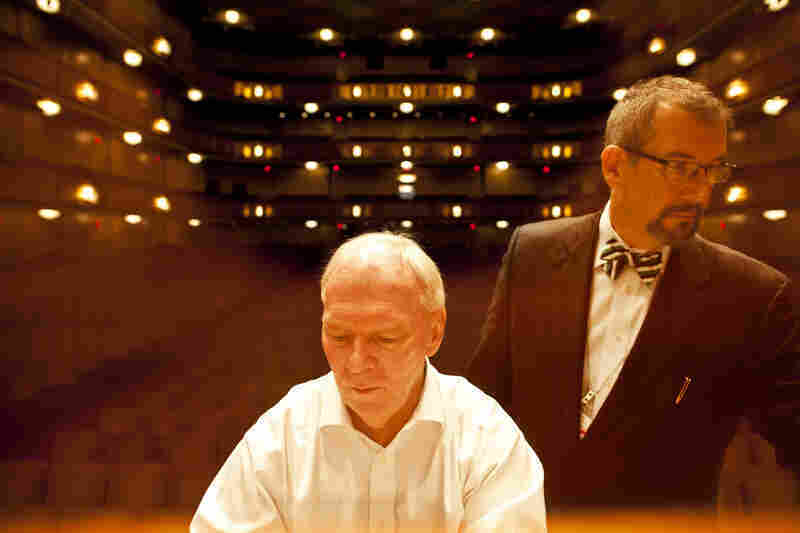 Each night, while the hall was silent, between 11 p.m. and 8:30 a.m., Richard Marchand and Daniel Fortin, two Casavant technicians, worked away at perfecting the sound of the organ. These nocturnal magicians say people tend to confuse the two functions they were carrying out — tuning and voicing. The tuning is relatively easy. It's the voicing that is really hard. "You can sing with an ugly voice but in tune, but you still sound ugly," Marchand explains. "Voicing is to work on the quality of the tone you are projecting." Tuning, it turns out, takes just a few days. But the voicing takes a couple of months. 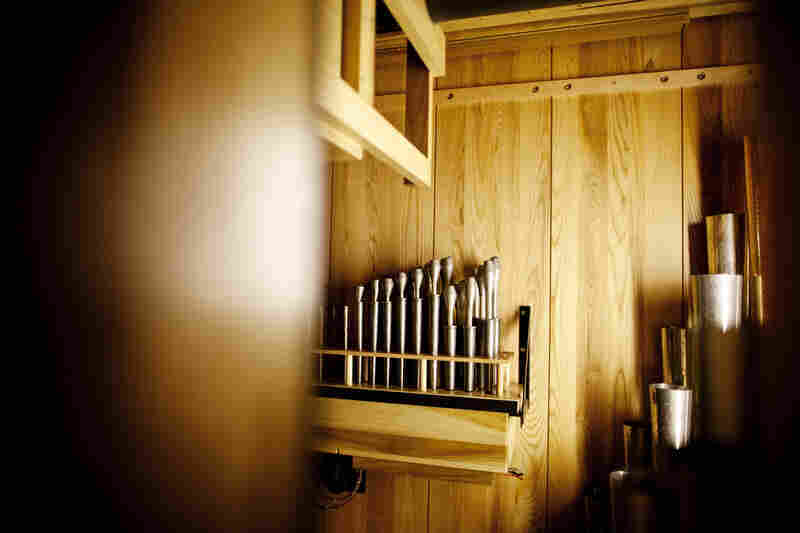 Marchand and Fortin, both of them musicians, work together — one sitting at the organ itself, the other climbing up and around inside the organ, using special tools to shift parts of the pipes, opening or closing an air hole here, shaving or moving a part of the pipe there. Much of this work is done 40 feet in the air, with tiny crevices to use as footholds. The two men switch off roles from time to time. If you just stay at the organ, they say, it is too easy to fall asleep. No such problem crawling around the organ like a cat. 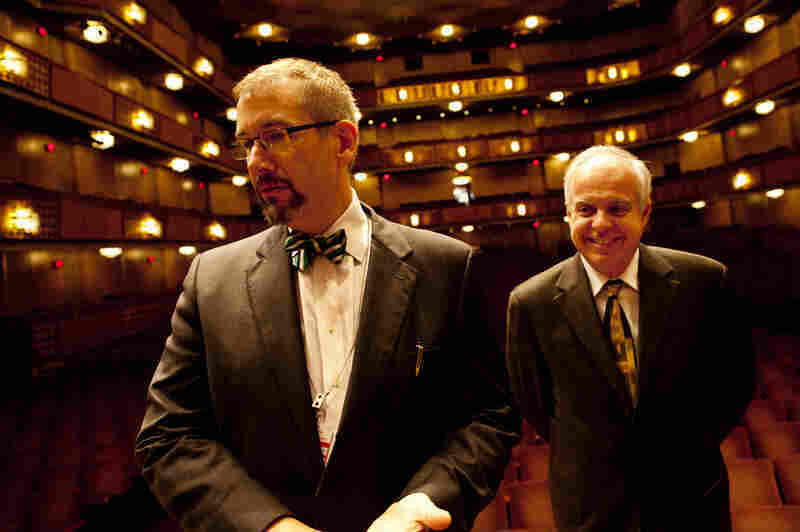 Organ consultant Jeff Weiler (left) and Casavant artistic director Jacquelin Rochette oversaw the tremendous task of building, installing and voicing the Kennedy Center's new organ. "If you are afraid of the height, it is not a job for you," Marchand says. The polished wood console of the organ — the part you see the musician play — is amazingly complex, too. It has four manual keyboards, 32 long wooden pedals and 104 stops. The stops look like porcelain knobs, and each one controls a set of 61 organ pipes, balancing the highs and lows, and the volume. "Each stop has a role to play in this tonal structure, so we are building sonic architecture of the instrument," says Jacquelin Rochette, Casavant's artistic director. When we visited a few weeks ago, Rochette said some of the pipes were still "barely speaking," that the sound they emitted was "simply barking." By now, they are supposed to all be singing. Organs are built to serve different functions. They are built for churches, for theaters, for academic institutions. 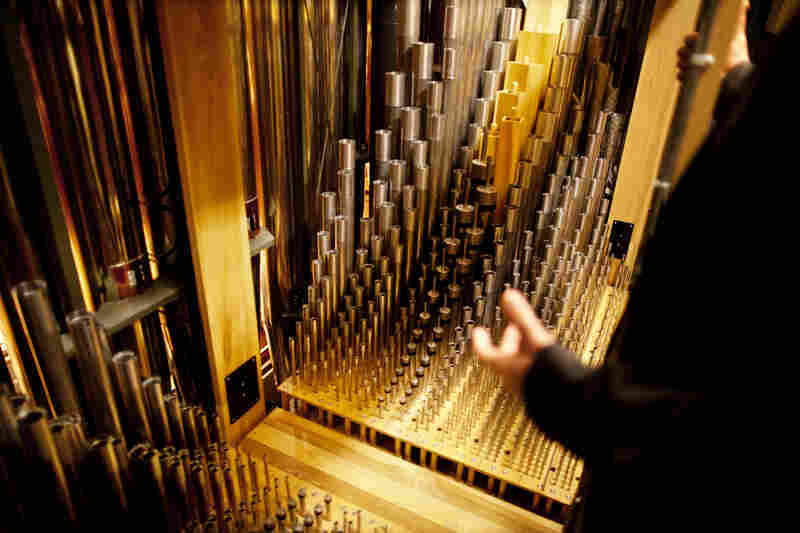 But in a concert hall, the organ has to have tremendous sonic power so it can soar over a large orchestra and chorus. It is the stops that throttle up the power — hence the term "pulling out all the stops." But for an orchestra, there is another balance to work out. The organ has to be able to play as if it were just another instrument in the orchestra, blending in so that the listener barely knows it is there. What is so fascinating about watching the whole process unfold is the anthropomorphic way everyone talks about the instrument. "The creation of an organ is very much like the birth of a child," says National Symphony Orchestra organist William Neil. "It's brand new, and it starts very humbly and very small and it grows, and as it matures and becomes a full-blown musical instrument, we have almost created here the adult." A month ago, Neil said the organ was "not quite there yet" but was "on the way." On Thursday night, the organ, now fully tuned and voiced into adulthood, was ready for its official, grown-up premiere performance.